Experian Automotive developed and launched a major initiative using Tableau Desktop and Tableau Reader to provide data to their clients who businesses touch the Automotive industry. Experian helps its customers increase market efficiency with cutting-edge vehicle statistics that help them make fact based decisions to better 'drive' their business directives. Heidi Haupt described how her team used Tableau to upgrade their product by providing fast, easy to use distribution of data with compelling visuals. Previously Experian delivered to their clients an "archaic, macro-driven pivot table," which had little visual appeal and was inefficient to produce. Heidi's team only took two days to develop the first demo-ready prototype, and had a production-ready version in two weeks - just in time for the national auto parts convention. Tableau Reader allowed easy distribution of extracts of Experian's data to their clients. Thanks to extract enhancements in 5.0, workbooks were significantly smaller than the prior product. 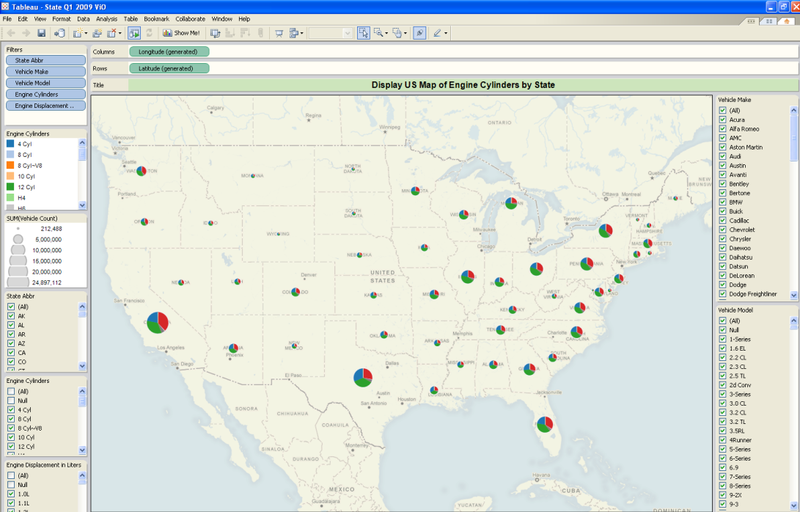 Experian found Tableau to be the best quick-to-market, low-cost solution. There is a clear migration path to Tableau Server, allowing Experian to scale out to larger audiences and with faster update cycles. Tableau has world-class visuals, presenting a very clear story of the underlying data. Experian wanted a path towards introducing ever richer visuals and interactivity, without overwhelming their clients with an idiosyncratic or nuanced product. This new product has resulted in 150% quarter-over-quarter increase in the number of data workbooks delivered to clients. Thanks to an embedded survey webpage in one dashboard, clients are able to give immediate feedback on product satisfaction; with the Tableau-based product, client usage is more efficient and the clients are quite happy. Heidi also reported that her team takes advantage of the latest technology in Tableau 5.0, including extensive use of filter actions and efficient extracts. For the latter, she explains how powerful it is to be able to hide unused dimensions and roll-up / aggregate data to the exact level of detail needed.